The BT-350 Fetal Monitor is an amazing Fetal Monitor designed to check your patients’ fetal health. The BT-350 Fetal Monitor is perfect for clinics or midwives who want to monitor several patients at a time. You can store information on up to 150 patients at once. The BT-350 Fetal Monitor can be used either notebook style or wall mounted, making it adapt to your needs. It features a seven inch wide TFT color LCD display, fetal heart sound play and record, and a rotating screen. The BT-350 Fetal Monitor also supports multiple languages, has a built-in quick-guide (LCD type only), a waterproof probe and is GE/Philips paper compatible. Standard Accessories include two ultrasound Doppler probes and holders, an event marker jack, power adapter and cord, three probe belts, a UC probe, two packs of printer paper, one bottle of ultrasound gel, and an operations manual. The BT-350 Fetal Monitor also has Doppler sound; Information sound; and an alarm sound. 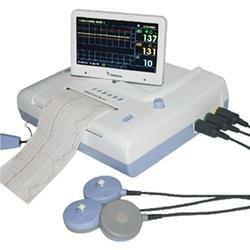 The optional BCM-350 PC-Interface (Central monitoring system) allows you to remotely control up to eight monitors; fetal heart sound record and play; unlimited multi-language support; wire (RS-232C) and wireless (Bluetooth) connection; network systems by LAN connection; and remote real-time picking-up fetal heart sound . The BT-350 Fetal Monitor comes with a 2 year warranty (accessories excluded) and would be a great addition to any clinic!